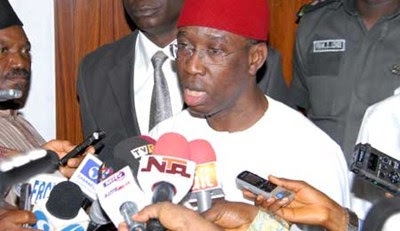 Delta State Governorship Election Petition Tribunal sitting in Asaba yesterday reserved ruling for about two weeks on the petitions filed by the candidate of the All Progressives Congress (APC) and that of the Labour Party (LP) against the election of Dr. Ifeanyi Okowa as Delta State Governor following the April 11, 2015 election. The tribunal chairman, Justice Nasiru Gunmi, said with the adoption of their respective written addresses by both the respondents and the petitioners, the tribunal would communicate the date of the final ruling on the petitions by the APC and LP on or before October 28, 2015. Dr Alex Iziyon (SAN), Mr. Timothy Kehinde (SAN) and Mr Onyechi Ikpeazu (SAN), counsel to Okowa, PDP and INEC, respectively, adopted the written address on the petition by Chief Great Ogboru and the LP as well as that filed by O’tega Emerhor of the APC. The counsel generally sought the dismissal of the two petitions seeking the cancellation of the election and an order of the tribunal for a rerun. However, counsel to the petitioner (Emerhor and APC), Thompson Okpoko, put up a spirited argument in attempt to impress it on the three-man panel that the presentation of the card reader as evidence “is not an orphan” before the law. Also, the LP and Ogboru pleaded with the tribunal to disregard the prayer of the three respondents, by nullifying Okowa’s election based on INEC’s declared result from the said election. Meanwhile, Rivers State Governor, Chief Nyesom Wike has felicitated with Nwogu and Osinakachukwu Ideozu. The governor also rejoiced with the elected PDP House of Representatives members from the state whose elections were upheld by the tribunal. Wike noted that the tribunal judgments which confirmed peaceful and credible elections in all the three senatorial districts of the state and the state’s federal constituencies confirm the overwhelming acceptance of the PDP in the state. He urged all federal lawmakers from the state to provide the necessary representation for their constituents in the bid to enhance the develop of the state and Nigeria.